A few days ago, a person whom I did not know, told me, “oh, and if we do not see you beforehand, Merry Christmas.” I had never met this person before, she knew nothing about me, yet I replied “Merry Christmas to you too.” I then had a horrible realization: with the holiday season approaching, the inevitable debates regarding Christmas will surface in the media and daily discussion. We have all heard these, “reason for the season,” say “Merry Christmas” instead of “Happy Holidays,” or vice-versa. That being said, with this article, I will focus on the debate between telling people “Merry Christmas” vs. “Happy Holidays.” I will show that the motivation behind saying the sayings are not only wrong, but what you should do instead. Let me interject for a moment and say that I do have some personal experience with this situation. I have worked a number of customer related jobs (retail, restaurants, etc.). At one location, we were told to say “Happy Holidays,” the other, my manager said say whatever you want. However, as I said, I am writing about this today because it is still an unfortunate reality. Final editorial note: The generalizations below are broad, so the reasoning I am about to provide does not necessarily apply to everyone. Some of the debates we hear surrounding saying “Merry Christmas” are because Jesus is the center of the holiday season, the United States was founded as a Christian nation, and Merry Christmas is the dominant (whatever that means) holiday. I hate to break it to Christians, but Jesus is a reason for the season, not the only one. In fact, I would argue there are actually two holidays going on: a secular Christmas and a religious Christmas, but that is another post. On the other hand, people say “happy holidays” because of the number of different holidays (religious and non-religious) celebrated during this time, a person cannot be sure of another’s tradition, etc. We as a society decided at some point that wishing someone a happy holiday like Christmas became offensive. Here is the problem with both sayings: When we buy into the argument of saying one phrase over another, we treat wishing someone a happy holiday as a punishment. People that say “Merry Christmas,” say it because they want the other person to acknowledge that Christmas is the reason for the season, and they want to hear affirmation back of Christianity by hearing “Merry Christmas to you too.” On the other hand, people that say “Happy Holidays” are acknowledging the holiday season, but worry about offending the other person. I should not have to explain why both of these approaches are problematic. Again, I also recognize that these are broad generalizations. This is how we should approach the sayings instead. If you are a Christian and you celebrate Christmas, wish someone a “Merry Christmas,” not because you want him or her to acknowledge it back, but because you are communicating to them that this is the tradition you choose to recognize. 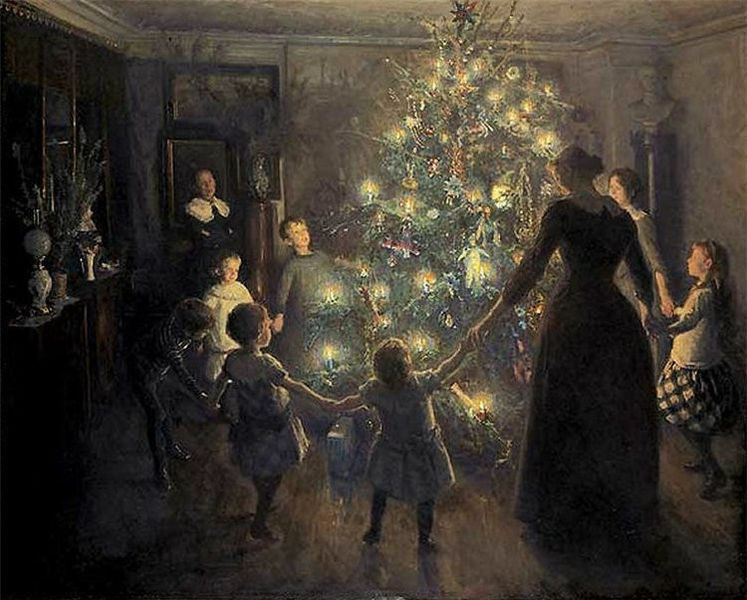 At the same time, if someone tells you Merry Christmas and you do not celebrate Christmas, your response should not be to become angry or offended, but instead “Thank you, and Merry Christmas to you.” We should stop using our holiday sayings to try to punish other people for what they believe, but instead recognize them as a person sharing his or her own tradition with those he or she meets. Stop listening to overly angry people in the media that want to turn everything into a war in order to justify their airtime. With that said, I would like to wish everyone an early Merry Christmas and Happy Hanukah. Thanks for reading. This entry was posted in Life and tagged Christianity, Christmas, Christmas and holiday season, Faith, Holiday greetings, Merry Christmas. Bookmark the permalink. Well, you are my favorite son-in-law. And I always read your blog. Thanks for your post! I agree–there’s no room for defiant, self-righteous anger at Christmastime! I love the mindset of simply allowing people to share their traditions. Thank you Sonja! Hopefully we can all find the middle ground between demanding a “Merry Christmas” and wishing everyone a happy *insert every possible holiday here. * Simply use this time to share your own tradition, that’s all. Thank you for reading! It’s sad but true. I have been raised Catholic my whole life and have always known Christmas as ‘Christmas’. Even individuals with different religious beliefs know this holiday has always been called ‘Christmas’. It is like wishing someone a Happy 4th of July, St. Patrick’s Day or Happy Thanksgiving. I’m sure not everyone in this country celebrates and honors these holidays the same. The word Christmas has been around so long a lot of people incorporate this word into music, literature, advertising, etc. If these people are so offended are they petitioning for everyone to change the names of these things to Happy Holidays?! I just don’t get it and I’m not one to force my religious beliefs on anyone but to me it’s a word and I am sure it means many different things to different people. It would be like me wanting to change the word Monday to something else because I find it offensive. I say leave it alone and keep “Merry Christmas” alive! People have every right to believe or not believe in something and to speak up for what they do believe in. If they are offended by this comment, that’s their business. My bad, Happy Holidays then. Who really cares anyway? It’s common courtesy/small talk that people should not take so personally. Thank you for the note “D!” I appreciate your point about how “Christmas” has permeated so many facets of society. I alluded to it in my post, but “Christmas” has multiple meanings for multiple traditions, even to the point where you could almost separate them between a secular holiday and a religious holiday. I am sure a sociologist somewhere has done a similar study. Thank you for reading!